This is actually my first review on tripadvisor, I don't have the habit of posting reviews but Wayan is so fantastic and sincere in what he does that I must recommend his services to you here. I sent a reservation email to him for an afternoon tour, requesting for pickup at my homestay. That morning, he emailed to postpone as his neighbour passed away from an accident and he had to help in ceremonial procedures. I was outside early in the morning and didn't have access to internet, and so wasn't aware of the email until I returned to the lodge around noontime. He couldn't reach me by mobile and i gave the wrong contact number of my lodge. He actually made the effort to come to my lodge to explain the change of plans and apologise in person. I changed to a morning tour on a saturday. There wasn't a group but he accommodated me anyway. We had some 7km walk through paddy fields, plantations, irritation systems, streams and rivers. I didn't have proper walking shoes on, except for a pair of blingbling city sandals, and he took great care of me throughout the whole tour. We visited a coffee plantation and I had a chance to taste 6 different types of tea and coffee. They are complimentary except for Luwak coffee, which cost 50K rupiah for one cup. 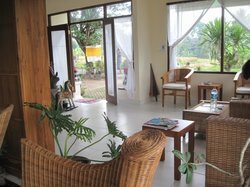 There is a retail section (with relatively high markup) for...This is actually my first review on tripadvisor, I don't have the habit of posting reviews but Wayan is so fantastic and sincere in what he does that I must recommend his services to you here. I sent a reservation email to him for an afternoon tour, requesting for pickup at my homestay. That morning, he emailed to postpone as his neighbour passed away from an accident and he had to help in ceremonial procedures. I was outside early in the morning and didn't have access to internet, and so wasn't aware of the email until I returned to the lodge around noontime. He couldn't reach me by mobile and i gave the wrong contact number of my lodge. He actually made the effort to come to my lodge to explain the change of plans and apologise in person. I changed to a morning tour on a saturday. There wasn't a group but he accommodated me anyway. We had some 7km walk through paddy fields, plantations, irritation systems, streams and rivers. I didn't have proper walking shoes on, except for a pair of blingbling city sandals, and he took great care of me throughout the whole tour. We visited a coffee plantation and I had a chance to taste 6 different types of tea and coffee. They are complimentary except for Luwak coffee, which cost 50K rupiah for one cup. There is a retail section (with relatively high markup) for natural coffee powder, tea leaves, aromatherapy incense sticks, essential oils, bar soaps etc. The tour wrapped up with a great lunch, included in his package. Having spent most of my cash buying stuffs at the coffee plantation, he was gracious enough to drop me at my lodge to retrieve my atm card and then drop me at the atm machine to retrieve cash. Wayan speaks excellent English (compared to other Balinese I have encountered) and exhibits deep knowledge in all things Balinese - culture, society, lifestyle, history and religion. He has travelled extensively to Europe and the Mediterranean region, and makes intelligent conversations with you along the way, so there is no boring moment with this terrific guide. The tour gave us a chance to enter a real family compound, which would otherwise be closed to tourists and was a really nice change from the shopping and spas in Ubud. Wayan was able to point out lots of different plants and take us to little nooks for a look at a waterfall and rock carved temple. The bananas and chilled water that the support car provides at two different points of the walk really helped as the day was really hot. I did a jungle tour with Wayan today and even though I was the only one who registered for the afternoon tour, he was authentically happy to take me. Even better he customized the tour to my specific desires. I wanted jungle and I did get jungle :) it was so much fun and we had a lovely conversation about Balinese culture. We ended up on a beautiful back country road, where we passed farmers and temples. I am happy to give the highest recommendation for Bali, Off Course Walking Tours. 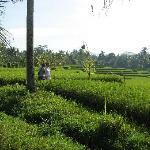 Tour owner and operator is Wayan Sumerta who is an expert in the Ubud region. His walking tour takes you off the noisy streets and immerses you into peaceful nature. I will not spoil the walk, but I can say that there was a pleasant surprise around every corner. 1. Wayan is super cool and neat to talk with. 2. He knows **everyone** in Ubud and beyond! Seriously, wherever we went, his friends and acquaintances beeped their horns or waved. 3. His transportation is comfortable with good A/C. 4. His prices are reasonable considering what you get out of it. 5. He is very knowledgeable in Ubud culture and can explain just about any question you throw at him. 6. Wayan has a great attitude and because he is the owner, you do NOT get a desperate, sad story from him like you may from tour guide employees. 7. He went out of his way to make my solo trip to Ubud memorable. 1. That I had to say goodbye at the end of my trip. I hired Wayan for the following two days to drive me to various attractions in the region. Again, it was more culture and knowledge that I expected. I hope you have the opportunity to get out and walk, sweat, hike and relax with Bali, Off Course! Most enjoyable and enchanting - entirely Bali! 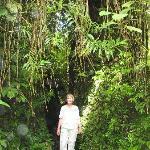 I am very happy to recommend "Bali Off Course Guided Walking Tours". My sister and I spent a most enjoyable half day tour with our friendly and informative guide, Wayan. Wayan picked us up from our hotel and the tour started with a blessing in a Brahmin Preist's family compound that was both charming and interesting. It was great to learn about the family's daily life and how the villagers conduct the lives. 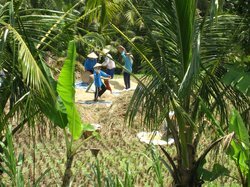 The walk took us through the really beautiful scenery of padi fields being planted and harvested so we could see the whole cycle of the padi farmers life. Wayan explained the life revolving around the rice fields, other plants, trees and wildlife. We also had the opportunity to visit a waterfall and experience the feel of the jungle, a very old temple and walk through villages. In all, our walk with Bali Off Course was a highlight of our visit to Ubud. We recently visited Ubud and were lucky enough to go on a tour with the owner of this company, Wayan. Wayan was a brilliant guide. He is very knowledgeable and he gave us a fascinating insight into both the local area and Balinese culture in general. There was a cremation ceremony on the day of our tour and Wayan re-scheduled the time of our walking tour so that he could take us to the ceremony as well. 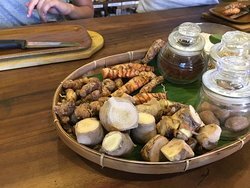 I cannot recommend the tour highly enough - it is a must do if you are in Ubud!